sinkerbeam: kidstuff: City Of Champions! Pittsburgh is having quite a year. The Steelers won the Super Bowl in February and last night the Penguins won the Stanley Cup! Evelyn was their good luck charm, making sure to watch the beginning of each game during their playoff run. 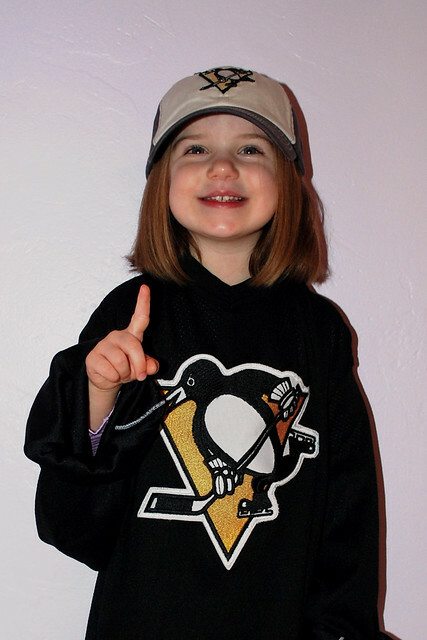 Go Penguins! Evy will have a whole closet full of Pittsburgh shirts soon. I would not hold my breath for the Pirates, though. Maybe you should campaign for a professional basketball team! Grandma C.